Renault's Fernando Alonso became the youngest ever Formula One champion by taking third place behind Juan Pablo Montoya in the Brazilian Grand Prix. Alonso needed to finish on the podium to secure the title and achieved his objective despite an early slip. The 24-year-old let Montoya pass when he locked a wheel on the second lap, but from there he drove a perfect race. Kimi Raikkonen, Spaniard Alonso's only title rival, finished second behind McLaren team-mate Montoya. That was enough to secure second place in the standings for the Finn. Alonso was already the youngest driver ever to clinch a pole position start in Formula One and the youngest to win a race. The title victory meant he beat Emerson Fittipaldi's record as the youngest champion by more than a year. "I am extremely happy and it is a very emotional day for me," said Alonso. "I came from a country with no tradition in Formula One and I fought alone basically because I have not had any help from anybody all throughout my career. "I arrived in Formula One thanks to the results in previous categories and my sponsors. "This is the maximum I can achieve in my life and career." Renault team boss Flavio Briatore paid tribute to his driver, saying: "It has been a fantastic championship and Fernando is a fantastic champion. Alonso was safely away from pole position and avoided the collision that took out three cars before the first corner. David Coulthard's Red Bull was involved with the two Williams cars, prompting the employment of the safety car. 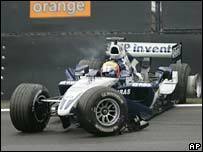 Mark Webber's Williams then burst into flames as it returned to the pits but no-one appeared to be hurt, the Australian later returning to the race. But Alonso suffered a wheel lock on lap two, allowing Montoya to take the lead. Raikkonen had jumped from fifth on the grid to third, but the Finn appeared to have started with a heavy fuel load. That allowed Alonso to open up a gap on his rival for the title. Raikkonen was able to take second place following the first round of pit stops, but he was unable to bridge the gap on Montoya. 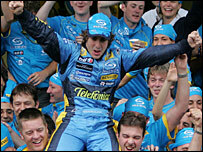 The Colombian's victory took him up to third in the standings, level with Michael Schumacher. Schumacher took his Ferrari to fourth place, with the second Renault of Giancarlo Fisichella fifth and Rubens Barrichello sixth. Jenson Button had to settle for seventh after qualifying in fourth, while Ralf Schumacher rounded out the points in his Toyota. The result meant McLaren became the second team to record a one-two this season - Ferrari were the first in the ill-fated Grand Prix at Indianapolis - to move top of the constructors' championship.